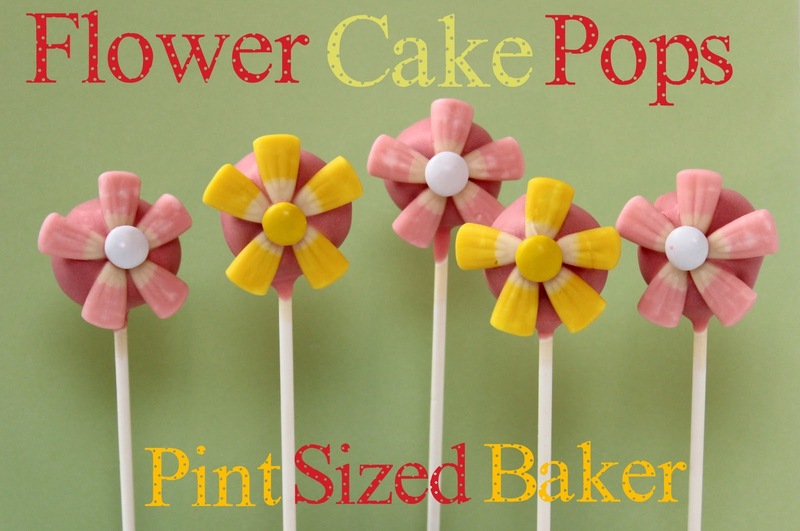 Another week, another cake pop tutorial. This is one of the most common cake pops for beginners. 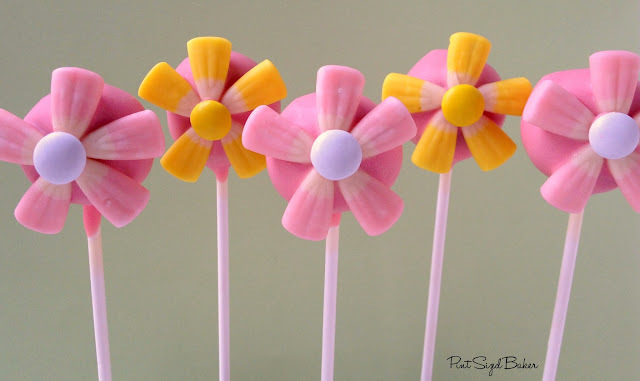 The simple Spring Candy Corn Flower. 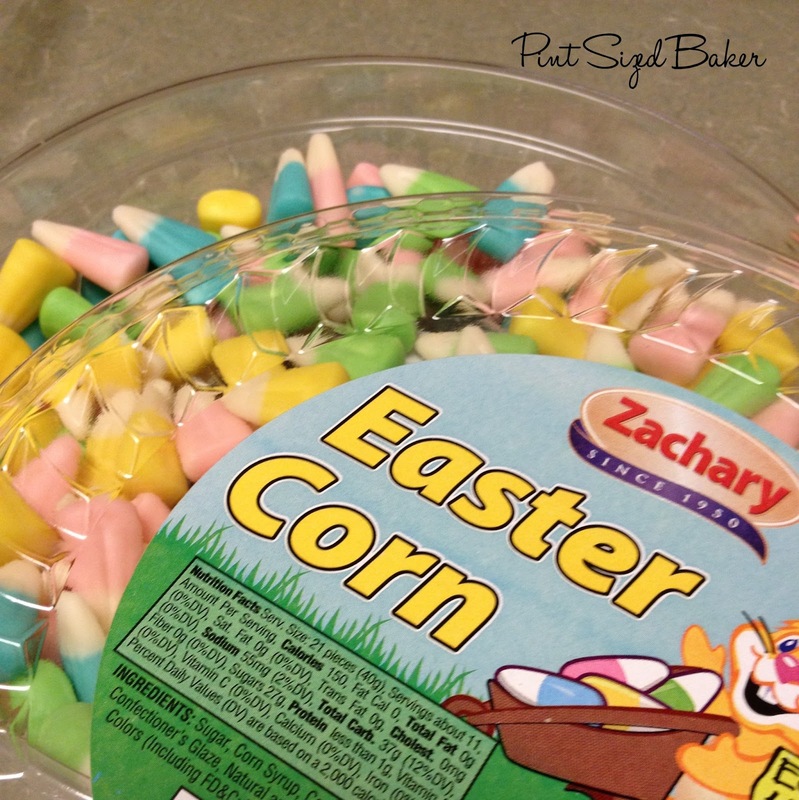 I found my Easter Colored Candy Corn at Micheal’s. I find a lot of my seasonal candy there. Start off with some basic round cake pops. Pick a fun spring color for the pop. 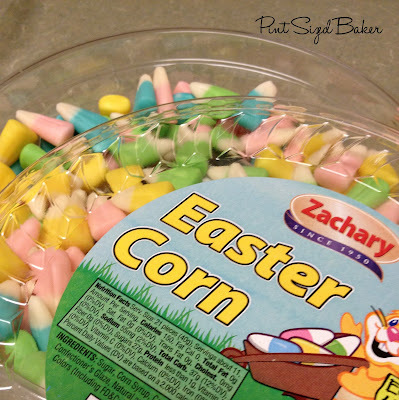 For these, I mixed a few red candy wafers in with a lot of white candy until I got the pink that I wanted. Dip the cake pop, tap off the excess and then add the candy. This may be a bit tricky if your candy melts are too thin and the excess is still dripping off the pop. 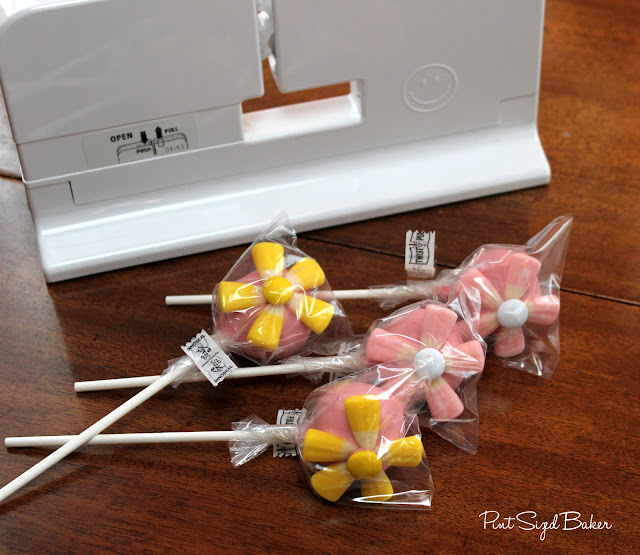 You need to wait to the count of 10 before adding the candy, but don’t allow the candy to completely harden. Once they are dry, I added M&Ms to the center. You can add any round candy that you like. I’ve used a few different ones when making these. Once my Pops are done and made, I’ve been putting them all into a sealed baggie. I don’t wrap them because of the time it takes to add twist ties to all of them. 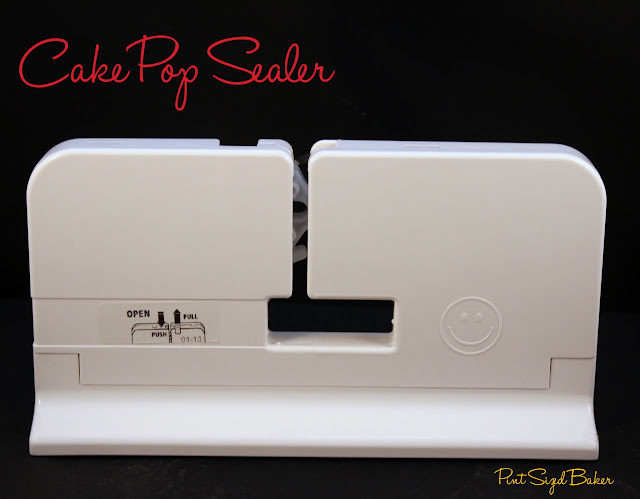 I was so excited when I saw the Cake Pop Sealer from Heavenly Cake Pops (the creator of the Easy Roller)! What a total time saver this is. Just zip it through and be done! Check out the Video from Heavenly Cake Pops! And here I am zipping my Bumble Bees up from last week. This actually took some practice. The first time I tried, I pushed the pop through too slowly. The second time I pushed too hard. I broke a few cake pops. I twisted the stick right off the pop when trying to get a tight twist around the pop. I bashed it down. I watched my kid destroy the pop while trying to open it. 1. Test the sealer a few times with an empty stick. Get a feel for the resistance from the tape. 2. When twisting the bag around the stick, don’t twist the stick. It will break the pop. Instead, hold the pop and twist the bag around the stick. 3. Hold your cake pop as closely to the sealer as possible. Don’t try and hold it at the end of the stick. It will break the cake pop. 4. Place a protective hand at the bottom to catch the pop. If you put a bit too much pressure on the pop, you’ll bang it down. It will break the cake pop. Try to give it a soft place to land, just in case. 5. Don’t let children (or men) try to open the sealed cake pop. They will break the cake pop. Instead, practice removing the seal from an empty stick and look like a total genius in front of them! 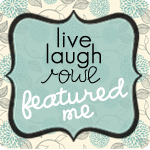 Once I got the hang of it, it was great! This is definitely a time saver! One of the toughest things to explain to someone is how to remove the seal. Pinch at the center of the paper, twisting one side up and one side down tearing the paper, then pull the paper apart and remove the tape. If you are cake pop maker, I’d suggest making a blank sticks with a few seals attached and let the recipient “learn” how to open them before BREAKING the cake pops. For more from Heavenly Cake Pops, visit them on FACEBOOK, on TWITTER, and on PINTEREST! Disclaimer: Heavenly Cake Pops provided the Cake Pop Sealer for me to test and review. All opinions are mine.